Ever felt that 96 or 103 or 110 cubic inches just isn’t enough, especially with the new Indian Thunderstroke out there with 111 cubic inches? Well, Harley-Davidson has the solution. Now, for selected models, you can order up a genuine H-D motor in Screamin’ Eagle trim that displaces 120 cubic inches. The punch delivered by all that displacement is in these numbers: 106 horsepower and 117 lb-ft of torque at the rear wheel. The new Screamin’ Eagle SE120ST Crate Motor (P/N 19221-15, $5,695, installation labor cost not included) from Harley-Davidson Genuine Motor Parts and Accessories is factory-engineered to pump up street performance and is designed for bolt-in installation in an original equipment-style Harley-Davidson Touring chassis with no required fabrication or engine mount relocation. The motor comes equipped with a Screamin’ Eagle 58mm Throttle Body that’s 18 percent larger than stock. The crankcase, cylinders and heads are painted black and feature machined aluminum highlights and chrome covers. 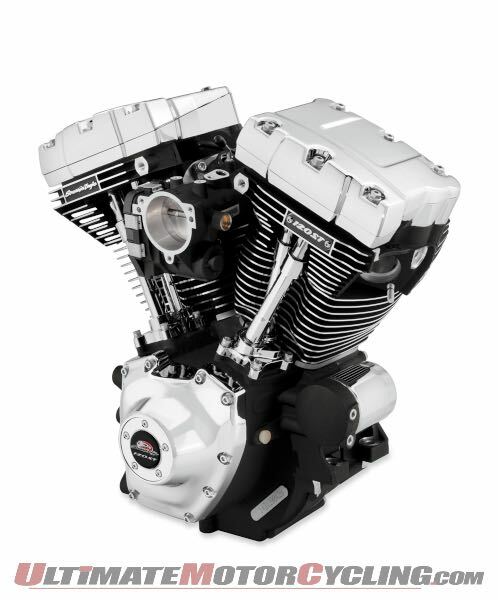 For best performance, Harley-Davidson recommends combining this engine with a Screamin’ Eagle 58mm High-Flow Air Cleaner (P/N 29400222, $159.95) and a Screamin’ Eagle High Flow Exhaust System (P/N 64800022, $1,299.95). The SE120ST engine was developed and tested in Milwaukee and is street-legal when used with original equipment mufflers or Screamin’ Eagle Street Performance Exhaust System P/N 64800022. All EFI models require ECM calibration. Engines delivered in the United States include Manufacturers Statement of Origin. Engine includes a one-year warranty. See an authorized Harley-Davidson dealer for details. • 49-state 2015-later Touring models. Does not fit Twin-Cooled models. • Certification is pending for California 2015-later Touring models. • Certification is also pending for all 50 states 2010 – 2014 Touring models. For additional information, visit www.h-d.com.